Do you want to get total control of your trading account? 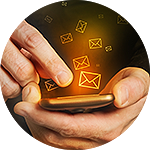 Use the free service "SMS-Notifications" on Margin Call situation. It lets you check your balance without logging in the Client area or the trading platform. Connect to the service in the Client area and upon reaching the margin level below 100%, you will immediately receive a notification and, if necessary, be able to fund using mobile payments. Do not worry about the market situation and spend your time the way you like. Please consider that the Stop out levels remain 20% for the Classic account, 40% for the Market Pro account and 60% for the ECN account.